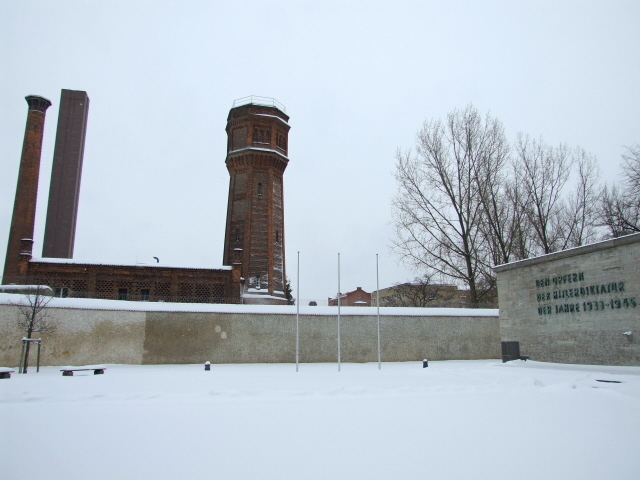 The memorial at the main site in Berlin for executions of (mainly) political prisoners and resistance fighters during the Nazi era in Germany 1933 to 1945, next to a still working prison. More background info: The prison complex at Berlin Plötzensee, then on the edge of the city, was built in the second half of the 19th century. It had already sporadically served as an execution site too, with 36 convicted murderers executed here in total up to 1932. After the Nazis' rise to power, the place entered an altogether different league. 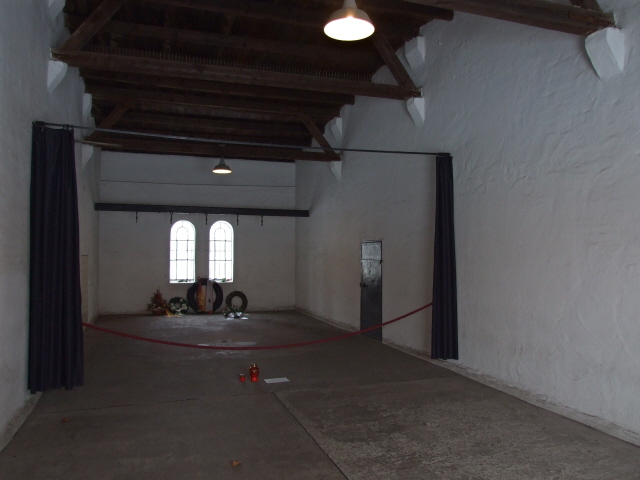 The prison now served as a main detention centre for political prisoners that the Nazis saw as enemies. Execution numbers increased (the method employed was first "by axe", as in the pre-Nazi period, then, from 1936, on Hitler's orders, by guillotine), but it wasn't until the beginning of WWII that the number of killings went through the roof. Now not only Germans and Austrians who were found to be political enemies of the Nazis but also prisoners from the newly occupied countries (especially from the Czech Republic, Poland and France), including deported forced labourers, were interned here – and living conditions deteriorated. The number of executions escalated too, and no more than in the year of 1943, in which 1180 of the total of nearly 3000 executions took place. The worst killing spree occurred in the "Bloody Nights of Plötzensee" between 7 and 12 September, when ca. 250 inmates were murdered, some of whom hadn't even been sentenced yet. Just before the prison had been partly damaged in an Allied bombing raid – which probably triggered the almost panicked acceleration of the killings. The guillotine had been destroyed in the bombings, so from then a special gallows was installed – where eight victims at a time could be hanged on hooks from a steel girder. Plötzensee was also the place where many of the conspirators of Stauffenberg's July 1944 assassination attempt on Hitler met their death. After the bombing at Hitler's Wolfschanze retreat in Poland had failed to kill him, retribution raged. 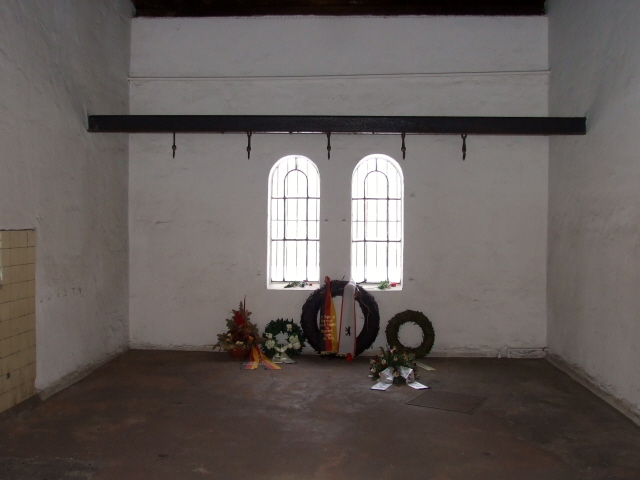 Stauffenberg and his immediate co-conspirators were shot the same night in the courtyard of their Berlin office building – see German Resistance Memorial Centre. Other co-conspirators, helpers or those simply associated with them by family ties or the vaguest of suspicions were henceforth put on show trials, most infamously at the so-called "People's Court" under its choleric "judge" Roland Freisler (cf. White Rose memorial centre in Munich). This series of over 50 show trials ended (predictably) in more than 110 death sentences. 89 of these were carried out here in Plötzensee between August 1944 and April 1945. As the Soviet Red Army reached Berlin at the end of WWII, most prisoners were released and the complex was captured on 25 April 1945. After the war, the main death row building was demolished but new blocks erected for a juvenile detention centre. It still partly fulfils this function to this day, but is now mainly a general prison for male adult "delinquents", and part of the complex houses a general prison hospital. Immediately adjacent to the prison, at the site of the former execution shed, a memorial to those murdered here was set up and inaugurated in 1952. It is overseen by the German Resistance Memorial Centre Foundation as one of its satellite sites (see also "Silent Heroes" and Museum Otto Weidt's Workshop for the Blind). What there is to see: Not all that much. Only for the especially committed dark tourist. As you walk from the bus stop towards the entrance to the memorial site, approaching along the high prison walls, two red-brick chimney stacks, one old, one modern, as well as an old brick water tower serve as a kind of cluster of beacons. Then you step through a kind of ante-courtyard before coming to the main walled-in larger yard, facing the simple memorial wall. The inscription on it translates as "to the victims of the Hitler dictatorship in the years 1933 to 1945". To the right is a large urn with a plaque in the ground stating that it contains soil from the concentration camps in Germany. To the right of the building with the memorial wall at the front, there are two gaps in the brick façade. The first leads to the memorial room. At the back you can see the steel girder which served as the gallows from late 1942. Five of the hooks are still attached to it. Beneath it, within a chained-off area there are wreaths and flowers laid down to honour the victims. Additional candles and notes are sometimes left by individual mourners too. 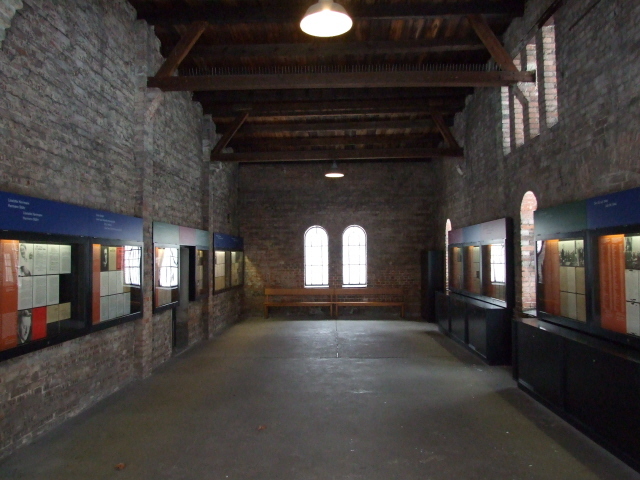 Here a small number of display cases on the walls contain texts, statistics, photos and a few copies of original documents related to the history of the place. These include a number of selected individual cases, which partly personalizes the otherwise rather distanced site. The main descriptive background texts are in German and English, the additional documents are not translated. The quality of the English translations is by and large OK, though there are a few oddities, especially a strange general use of the present tense for the past (obviously taken directly from the German, where this usage isn't totally normal either). Interestingly, this use of tense has been rectified in the newer English leaflets about the place, which partly feature the very same texts. So somebody must have noticed this before, but apparently there hasn't been a chance to amend the exhibition panels likewise yet. In a corner by the entrance there's also a solitary computer terminal – the only modern feature at this memorial. 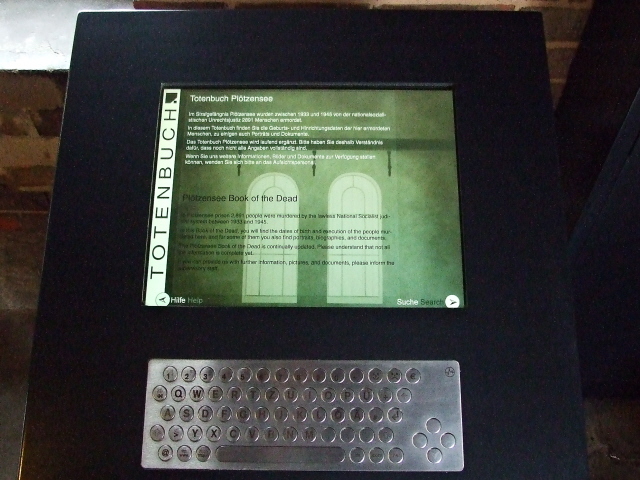 It contains a "Totenbuch" – 'Book of the Dead', in electronic form: it's an interactive database where you can search for all the victims murdered at Plötzensee, either by name or by nationality. Where available there are also photos and additional documents you can read on screen. There's an English option too. Unless you already know a lot about the place and its victims, this additional feature feels a little arbitrary. There are too many names to find out much simply by browsing randomly; but if you're already familiar with a particular person you are searching for, then the info provided may well be familiar to you already. 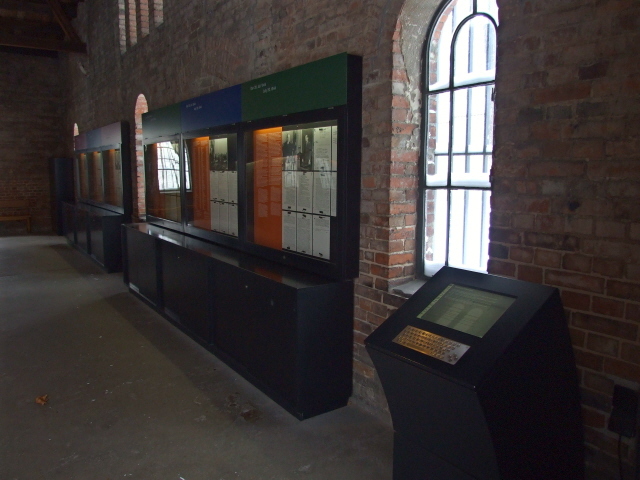 Anyway, you can also access this database from terminals at the German Resistance Memorial Centre. Overall: this is a dark site that's really only worth the effort of getting there if you have a particular special interest in, and a degree of prior familiarity with this element of Germany's dark history, and is more rewarding if you can read German (for the documents and statistics that are not translated). Otherwise don't bother. Location: at Hüttigpfad, which runs parallel to Saatwinkler Damm, out in the north of the West Berlin district of Charlottenburg-Wilmersdorf, east of Jungfernheide and just west of Westhafen, not far from the city centre airport of Tegel to the north-west. Access and costs: a bit off the beaten track, but not too difficult to reach; free. Details: It's a bit of a trek to get here, but you can get there by bus. Line 123 has a dedicated stop, "Gedenkstätte Plötzensee", which is just a few minutes walk away (signposted). The nearest regional metro station is Beusselstraße (S41/42 Ring-S-Bahn), just three short bus stops away on line 123 (not very frequent, though, ca. every 20 minutes only). You can also get the 123 from the metro stop (U9) Turmstraße, or even all the way from the main station ("Hauptbahnhof" – but it's a long ride from there). Beusselstraße station is also served by the handy TXL airport bus, which goes straight through the central district of Mitte, e.g. from Alexanderplatz or Unter den Linden (near the landmark Brandenburg Gate). NOTE: do not make the mistake of assuming that the TXL bus also stops at the memorial's stop, just because it goes the same route along Saatwinkler Damm here. I found out otherwise when I went there in January 2010. On my map the red dot indicating the bus stop led me to believe that the TXL Bus would take me there without the need to change. Instead it went straight past it – and the next stop was at least half a mile away. That wouldn't normally be such a big deal, but in the deep snow of that harsh winter in this isolated area (where the pavements had hardly been cleared of the thick layers of snow) it turned out a pretty miserable and cold hike … and the memorial is in the open air too (with only the toilets providing a chance to warm up)! In theory you could also walk the signposted 1000 metres from Beusselstraße station – but it's anything but a scenic route, crossing a motorway and through drab warehouse areas. I'd recommend taking the bus in this case. Opening times: daily from 9 a.m. to 5 p.m. in summer, and only to 4 p.m. in winter (November to February). Time required: For a look at just the gallows and the memorial, a few minutes could do – if you want to read all the text plaques, add another half an hour or so. Only worth it for the really dedicated. Combinations with other dark destinations: generally, see under Berlin – there's nothing else in the immediate vicinity of the memorial, but the Anti-War Museum (a fitting combination) isn't located too far away, at least not as the crow flies (just over a mile), though the walk isn't pleasant (along busy roads) – you can go by bus, too: first line 123 back down to Beusselstraße, and then line 106 going east towards the terminus at Seestraße metro station (U6). Get out one stop before that, at Antwerpener Straße and turn right into that street and immediately right again, into Brüsseler Straße. Combinations with non-dark destinations: in general see Berlin – not surprisingly, the whole area around the prison isn't touristy in any way at all.